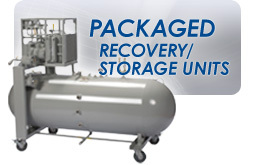 Larger 2.0-hp open drive compressor, 1/2” lines, two point vapor extraction, & oversized air cooled condenser accelerate recovery on larger tonnage cooling systems. Purging lines and switching from liquid to vapor recovery modes simply involves turning three 3-way hand valves - no switching of hoses is necessary. 450-psi high pressure shut off and 15-in. Hg vacuum low pressure shut off.